77,394 just from mobile devices (not counting tablets). A 90 Day Snapshot January – March 2019… from inside our system of the number of opt-in leads our members generated. I’m seeing many more leads coming from mobile compared to desktop. Does that mean something is wrong with my website on the desktop side? Most likely the answer is No. There are variables within Google Ads (AdWords) that can factor into a higher or lower mobile conversion rates. Such as, mobile device bids can be adjusted up or down for better ad positions, therefore generating more traffic and leads. Or, the Google Ads “click to call” button will record conversions that are not an option within the desktop category. 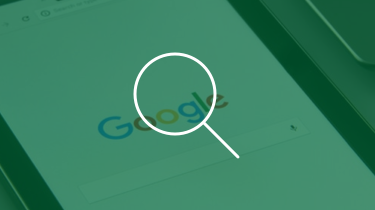 Google Ad accounts that have a high volume of calls may have a discrepancy in leads. Also, mobile leads have been trending upward the past few years. So, seeing mobile leads beating desktop doesn’t surprise us a bit. But that does lead to an important update. Just how many member leads are coming from mobile devices right now? 54.85% is the percentage of leads coming from cell phones (mobile devices) alone on the Carrot member platform. 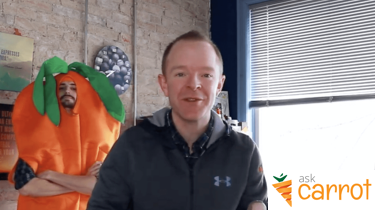 Over the past year, the traffic and leads that our Carrot members have generated through our Inbound Online Marketing platform for real estate investors has ebbed and flowed each month and tops 48,000+ leads per month right now. You can have a beautiful looking website, but if it doesn’t perform and convert visitors into qualified leads, it’s not doing you much good. So with the plentiful data we have on over 600,000 visitors a month (motivated house seller leads, cash buyers, note sellers, private lenders, rent to own, etc.) we’re fortunate that we get to see a lot of interesting stuff that no one else in this entire industry has a chance to have access to. You read that right. 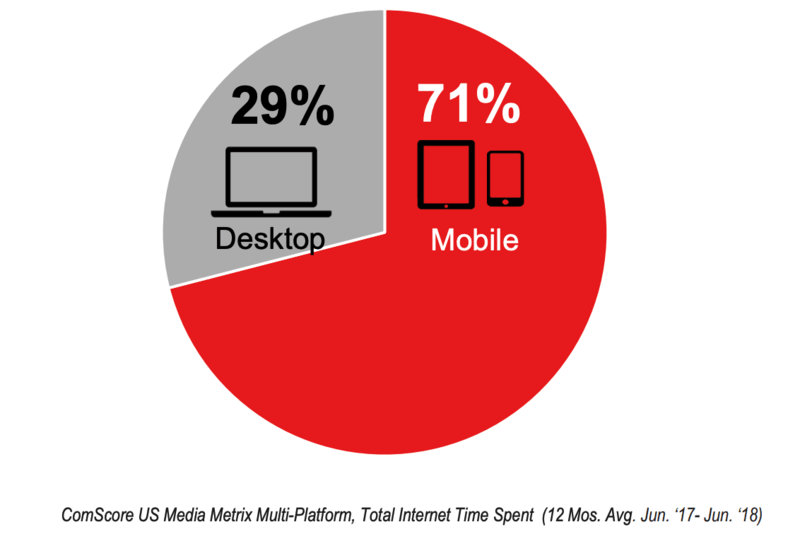 Mobile users are dominating the time spent online by a device. That includes tablets and smartphones. #2 – Vistors will simply stop coming to your website in favor of a website that provides a better mobile experience. We reduce this risk…Carrot websites are ALWAYS optimized for mobile. We’ve known since 2014, that mobile was going to be increasingly important in SEO and in converting more visitors into leads. 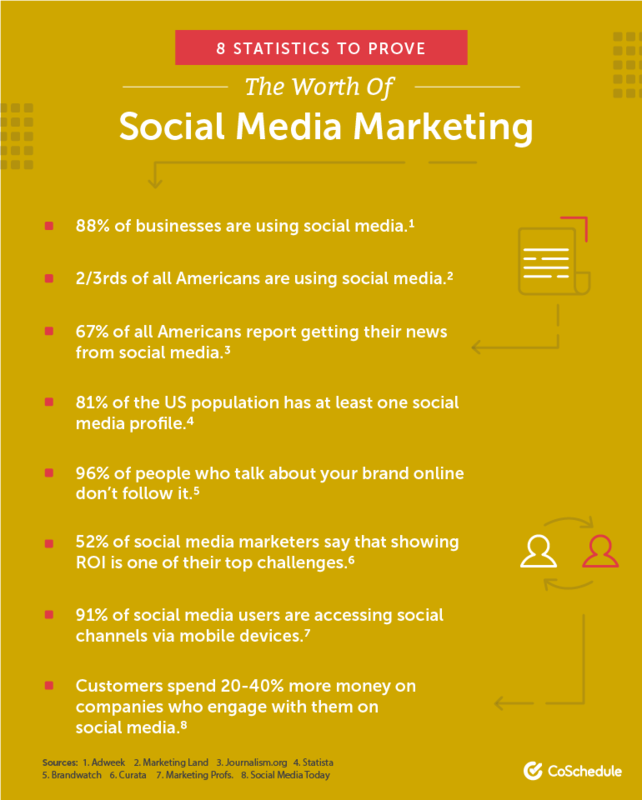 More and more people are using their phones to search, opening emails, and spend huge amounts of time on social media. … Mobile Is Important To A Real Estate Website + Online Marketing Strategy. Mobile keeps growing. In 2017, the number of smartphone users in the United States was estimated to reach 224.3 million. Obviously, cell phones and tablets have affected online lead generation efforts of real estate investors and agents. Here are a few things to you can do to help grow your mobile lead generation online. How Mobile Stacks Up When It Comes To Your Leads: A full 54.85% of the opt-in leads (this number doesn’t include phone call leads) generated through Carrot in the past 90 days came from cell phones or tablets. Does your website perform on mobile? We’ve written posts about the importance of having a mobile friendly website. If you’re questioning if your website is “mobile friendly” … test your website here. The better mobile experience you’re able to give those who land on your website, the better your website will perform. But, having a pretty, “mobile optimized”, website isn’t just for the looks anymore. We must pay attention to how well it converts mobile users into leads. Even if you do have a mobile-friendly website but it just isn’t geared to make it easy for a motivated house seller or cash buyer to engage on your website and opt-in as a lead… you most likely have a leaky bucket. You’re likely to be leaving $1000’s on the table. 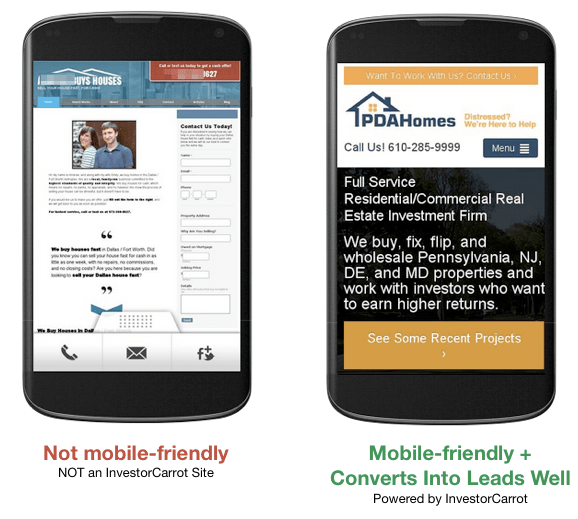 Mobile-friendly vs. Non-Mobile-friendly: Carrot websites converted over 77,349 leads in the past 90 days on mobile devices alone. See the difference between the Mobile-friendly Carrot site on the right vs. the Non-Mobile-friendly site on the left. Our websites are built to be much easier and more effective on mobile devices. Back in 2016 what you’dl hear is “If you don’t have both a Mobile Friendly website according to Google AND have a website that converts visitors to leads well on mobile, your online marketing efforts will suffer as a result“. If 54% of the leads that came through Carrot in the past 90 days were on mobile devices that shows us that optimizing the website for conversion on mobile devices can be a big way to improve the number of leads you pull in on your site if you’re already generating solid traffic. We give you some tips below on what you can look out for on your own websites to improve their performance on mobile devices. First… Check to see if your current website is considered “Mobile Friendly” by Google in their free tool. 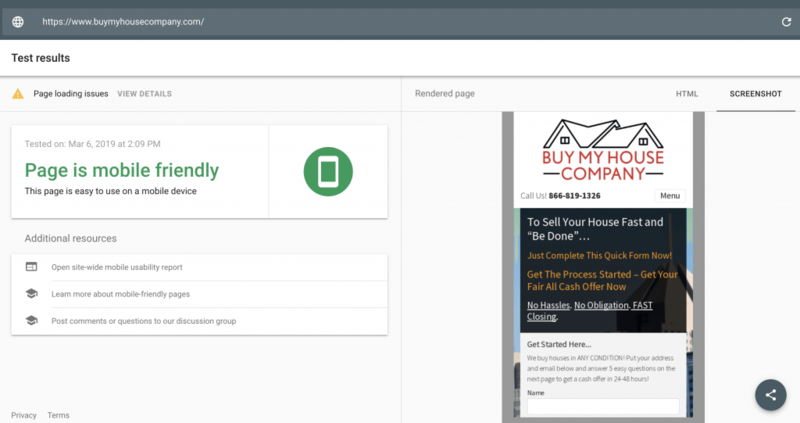 If it’s not considered “mobile-friendly” by this Google test tool, you’ll want to get your current website redesigned to be”mobile-friendly”. Or, just join Carrot so you’ll never have to worry about even thinking about continually staying on top of the mobile changes because we do it for you. Make sure the visitor doesn’t have to “pinch pan or zoom” to find your opt-in forms or phone number. Make sure the form fields on your opt-in forms are easy to read. Make sure they are large and clearly labeled so the visitor knows what to do quickly and easily. Don’t ask the visitor to enter in more than 3 to 4 form fields. If you ask too much on the initial form, you’re making it hard on them to take that first step. Make sure your phone number is clearly shown at the top of your website when viewed on a mobile device and highlighted so visitors can “tap to call” to easily contact you. Make sure the font sizes on your pages aren’t too small to be easily read on a mobile device. As more and more people use mobile devices to do their web browsing, having a website that is not only “mobile-friendly” for SEO reasons, but also optimized to convert a mobile visitor to a lead at a high rate is extremely important. If our members pulled in 54% of their leads (77,394 leads generated from mobile devices) from mobile devices in the past 90 days, how many leads have you lost because your website isn’t set up to perform well on mobile? One missed deal could amount to $5k-$10k in lost profits. That would pay for your Carrot membership for 10 years! Want some feedback? Send us your own website through the comments section below and we’ll analyze it to see if it’s “mobile-friendly” according to Google. We’ll give you feedback on ways you can improve the conversion rates on that website. We’re here for you! 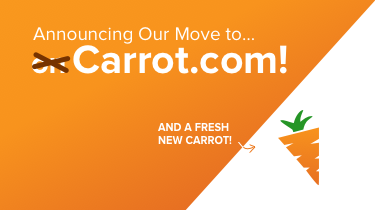 If Carrot is a good fit for you, go ahead and take our demo or find a plan that fits your business.